TPC Overall Rank: #15 out of 2933 rides. In User Top 10: 259 times. User Tracker Count: 296 times. Best ride in the park without question. Would be a 10 if the drop was higher and if the ride overall was faster. Can B&M build coasters higher than this one? Awesome ride. Probably the most fun in the park. Its so smooth thats how it beats Alpengeist and the seats are so comfortable i could sleep in them. Apollo’s Chariot is often regarded as one of the most enjoyable coaster experiences our planet has to offer. I mean, here it has gotten spectacular review after spectacular review and it has a massive reputation and hype many coasters simply couldn’t live up to. Some rides that have been ranked highly have delivered great rides for me (Steel Force and Phoenix), while others were a tad disappointing (Alpengeist). Could Apollo’s Chariot live up to the heavenly hype that constantly surrounds it? In one word, YES! Busch Gardens dense and beautiful vegetation conceal many of the parks attractions from view as you drive up to the park. But nothing can conceal the parks star attraction, Apollos Chariot. 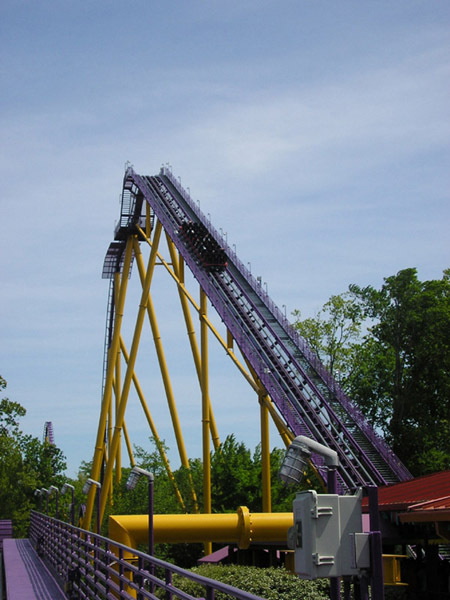 The massive purple and yellow colored ride was visible for quite a distance and made me even more excited for my ride. 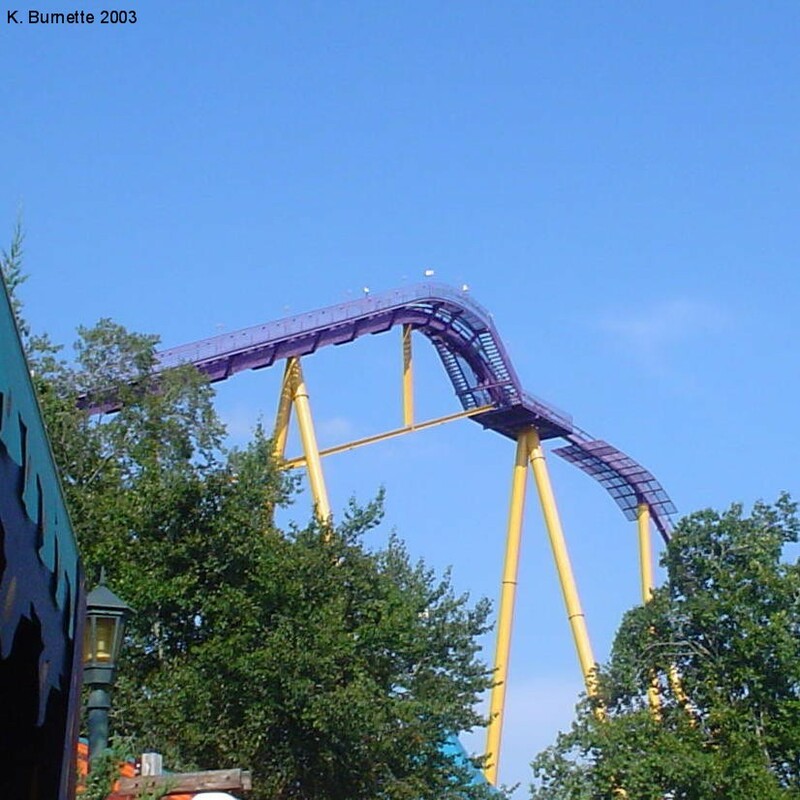 Once entering Busch Gardens Europe, how could one coaster enthusiast but head for this colossal coaster? Occupying the entire left side of the park, off-ride you cant see very much of the layout except a few of Apollo’s towering hills in the distance. But being nestled next to trees isn’t the only thing that helps conceal this ride, as it is literally is one with the land. Despite being a hyper coaster, Apollo should be considered a terrain coaster, as every drop and turn goes way down to ground level. This may not seem like much, but somehow despite being an out-and-back coaster, the layout was a surprise thanks to the noticeable height differential in the sizes of the ride’s majestic plunges. I had heard that Apollo’s Chariot was a capacity machine prior to riding. Each train holds 36 people as each row seats 4 people (which I like because single riders like me can get on quicker if there’s an open seat and the operators ask for a single rider ). While the trains each sat plenty of riders, many of the operators just sat fidgeted around and when they did check restraints they were pretty slow, leading to some horrible stacking. Nonetheless, I encountered waits of about 15-25 minutes depending on whether or not I chose the front or back seat. As for the highly praised B&amp;M hyper-trains, they simply didn’t disappoint. Apollo’s open-air, trains were amazingly roomy and exceptionally comfortable. The only thing securing you is a red lap bar, which is amazingly secure and comfortable at the same time. For most of my ride, I didnt even notice the lap bar even there! Apollos Chariot begins like many other coasters, a relaxing (well for me anyways) climb up to the heavens, which provided great views of Busch Gardens off to the right. But once at the top of the 170ft tall lift hill (it seems higher), Apollo toyed with me and the rest of the train with the ingenious straightaway that really builds anticipation for the experience that follows. And the attraction begins with simply the greatest first drop of any coaster! Not only is the drop incredibly long, steep, and thrilling, but there’s amazing sustained floater air the entire way down that is simply unmatched by any other coaster that is made even better by the heavenly restraints. While it lacks major Gs of Intamin’s highly-touted hypers, this drop is just pure bliss. Wow! Well, it’s definitely a hard act to follow, but Apollo manages to with a great parabolic hill that follows that gives some more world-class air throughout the train, especially in the front cresting the top. Following that came the insane turnaround that is visible from the parking lot. Beginning with a steep, swooping plunge that gives even more sweet air for riders, especially for riders on the left-hand side of the train, it’s followed by a fast and furious turnaround that literally hugs the ground. While it unfortunately isn’t overly forceful, the speed maintained throughout the graceful twists is simply incredible, especially in the front seat at night. Few coasters can match the sensation of speed Apollo provides during this segment, and the only one I’ve been on that can is Superman (er Bizarro) at Six Flags New England. After a quick mid-course brake run, there comes arguably two of the most forceful drops I’ve ever experienced on a coaster. Whoever says B and Ms are gentle have to experience these two drops, as they provide absolutely mind-blowing ejector air that even rivals, dare I say it, Intamin hypers. Each drop is not only intense, but travels right on down to ground level as well, so don’t be fooled by their rather unimpressive height since they are simply incredible. Of the two, the second one is slightly better if I remember correctly since it just seems longer and more thrilling in my opinion. Afterwards comes a unique little S-hill that looks innocent, but provides some decent floater air throughout the train, but especially for riders on the right hand side of the train. Finally there is the final hill, which has a little tease drop that gives a small pop of air, but that’s only the appetizer for what’s to follow. To punctuate an incredible ride, there’s a sudden final plunge that gives some dazzling ejector air. And during this, don’t forget to smile for the camera unless the sheer abruptness of the air is simply too overpowering for you. What a finale to a great ride! Apollo’s Chariot simply is an all-around world-class coaster that holds the title as my number one coaster, both wood and steel! Yeah, it’s just that amazing. It’s got absolutely amazing air, the most comfortable trains of any coaster, great landscaping, and it’s a glass smooth ride I could ride over and over again. In fact, I did ride it over and over again and it simply blew me away time and time again. In my opinion, the ride is flawless! Of the seats, I personally enjoyed the back better because of the crazy air achieved during the drops, but in any seat you can’t go wrong on this extraordinary coaster. Under no circumstances should you even consider skipping this absolutely incredible coaster during a visit to Busch Gardens. This was a great ride! That dip at the top of the lift resulted to more wip at the drop then Nitros. It had a lot of suprises. "Dont ride in the front, your nose might get broken. Oh wait, your nose isnt as big as Fabios. You will be fine." Driving in from Rt. 60, Apollos Chariot is the first welcoming site for miles - nothing but trees and rundown shacks that people call home. It didnt really hit me that it was actually that ride that I was looking at in person. I had been waiting so long to see it and ride it. It is a beautiful site, but no where near as beautiful as the Italy section that it is in. The line moves very quickly as the ride ops are very good and the three train operation keeps things moving (Im sure it would be speedy with just two trains, they are that good). A bunch of things suprised me on this, good and bad. I will start with the good. Its funny. When you look at the ride you notice things, but when you are actually on the ride you forget about them. This happened at the beginning and the end. I will remember for the next time I am riding, but for the first ride it was odd. I knew there was a dip before the first drop, but didnt expect it. I thought we were going to plunge. Silly me. Then, at the end of the ride before the final drop there is the straight away. I forgot about the final drop and it was a total surprise, and the expression on my face on the on-ride was evidence of that. The final drop was the best part of the ride for me. I also loved the way the ride worked with the terrain. Talk about a great feature that is so common with all of the coasters at this park. Now for the negatives. I dont find this to be an airtime machine. There were trims that really killed some of the moments of heavy airtime, especially on the one curved drop on the back end. I now have to make a comparison with Nitro, since it is the only other B&M hyper I have ridden. I hit the brake run and immediately said "I like Nitro better." I think that Nitro packs more of a punch, and it took my breath away more on my first ride then what Apollos Chariot did. Also in comparison with Nitro, I find the helix on Nitro to be much more powerful and forceful than that of Apollos. I was waiting for the forces, but it turned out to be a smooth sail through the twisted secion. Maybe I just caught it on a bad day, running poorly and with heavy trims. I know that I have caught Nitro on way too many bad days this year. I will certainly have to ride a few more times to get an accurate depiction of Apollos Chariot. As of now, I can say that it is a very good ride and is my second favorite steel coaster. I dont want to make everything negative here. It is great. I just need a little more time for some bonding I guess. Firstly, Id like to say that I love the mythological theme of this ride. I always liked the story of Apollo driving the sun across the sky in a chariot. Thankfully the ride is cool enough to match the myth. The first thing that you see getting in line is the awesome sun throne. The left most seat in the last row was my favorite seat location. The back of the train gives excellent ejector air on all of the hills. I constantly had the feeling like the train was leaving me behind as it was hurtling down hill after hill. I loved the swooping drop with the left turn into the helix. The ride works with the landscape very well. The ride was fast and forceful, but oh so smooth. The coaster looks as good as it rides. The restraints allow good range of movement and they are soft. I had the pleasure to ride the Chariot 7 times and the only bad part about the ride was when I had to get off of it. I could even check up on my car in the parking lot from the taller hills on this coaster. I even liked the artwork on the souvenir t-shirts for this ride. A definite 10 coaster. All substance, no hype! One of the most underrated coasters in the world. AC is the best B&M coaster I have been on, and ranks #7 in my top 10 coasters. I feel it is better than Nitro. In the back row it has airtime that borderlines ejector/floater, and it is sustained as long as Nitros floater airtime. The palcement of the ride is awesome, it was freshly painted when I went last year (6 years after its opening year), themed nicely, has a very nice layout that takes advantage of the terrain and scenery, and like other B&M hypers, extremely smooth with comfy trains. Something about this ride has always left me cold. The cars are cool and the scenery should add a lot to the ride, the way it works with the terrain in the valleys and stuff...but, ultimately, Ive always felt it was lacking something. If there is such a thing as "too smooth", this is surely it. Everything whooshes by smoothly and quickly and before you know it the ride is over without ever really offering as much of a thrill as I was expecting out of a ride this size. Not a bad ride, but honestly, Id take the ol Drachen Fire over this...whiplash and all! Man i love these kind of coasters. Good old hypers. Great first drop, fallowed by many others. Some good twists and turns in the middle, fallowed by some more fast hills. Its a lot like Nitro(same type of coaster). I do feel Nitro is the better of the 2. The cars/seats on these coasters are awesome though arent they? After riding Millennium Force this ride just didnt do it for me as it probably would have if i hadnt been on MF first. A good smooth ride though but just not enough speed.